In medium microwavable bowl, mix potatoes, 1/2 cup of the water, the butter, garam masala and salt. Cover; microwave on High 1 to 2 minutes or until potato mixture is steaming hot. Stir in peas and cheese. Divide mixture evenly among wonton wrappers (about 1 1/2 teaspoons per wonton wrapper); mound filling in center. Lightly brush two adjacent sides of each wonton wrapper with water. Fold wrapper in half diagonally over filling; press firmly to seal. 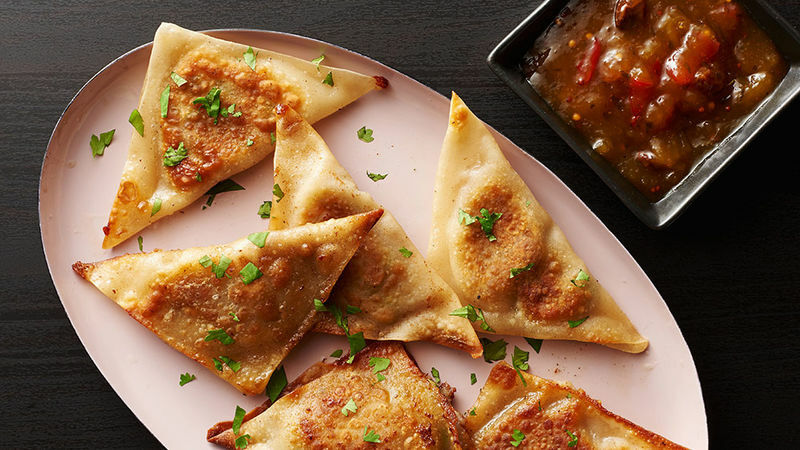 Cook samosa potstickers in 2 batches. In 12-inch nonstick skillet, heat 1 tablespoon of the butter over medium-high heat. Add 12 potstickers; cook 1 to 2 minutes or until browned in spots. Turn potstickers; drizzle with 2 tablespoons water. Quickly cover, and cook 1 to 2 minutes or until filling is hot. Repeat with remaining 1 tablespoon butter, 12 potstickers and 2 tablespoons water. Sprinkle with cilantro; serve with mango chutney. Have other favorite Indian condiments? The straightforward flavors in the samosa filling work well with lime, mint and tomato chutneys as well. Potato filling can be made up to 4 hours ahead, then covered and refrigerated until ready to fill potstickers. Let filling stand at room temperature 30 minutes before filling potstickers.